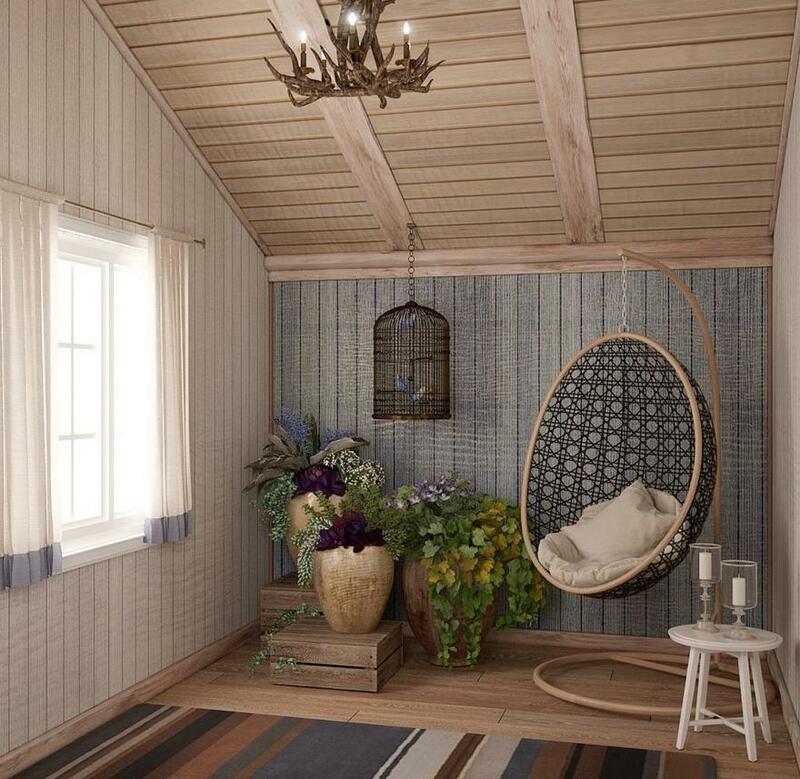 A young family couple with a new-born kid was dreaming about having a cozy nest close to the nature. And the interior was supposed to be inviting for rest and serenity and letting fully feel and enjoy the comfort of living in the countryside. But it is one thing to build a house from scratch. And it is another thing to be able to rebuild and turn an old frame of logs to advantage. And that is exactly what the masters wanted to do: they had an old five-walled log house with a vintage masonry heater that they wanted to restore and preserve. To make all their dreams come true, the architect put an extension to the old house and organized there an entry room and an open-concept living room and kitchen. 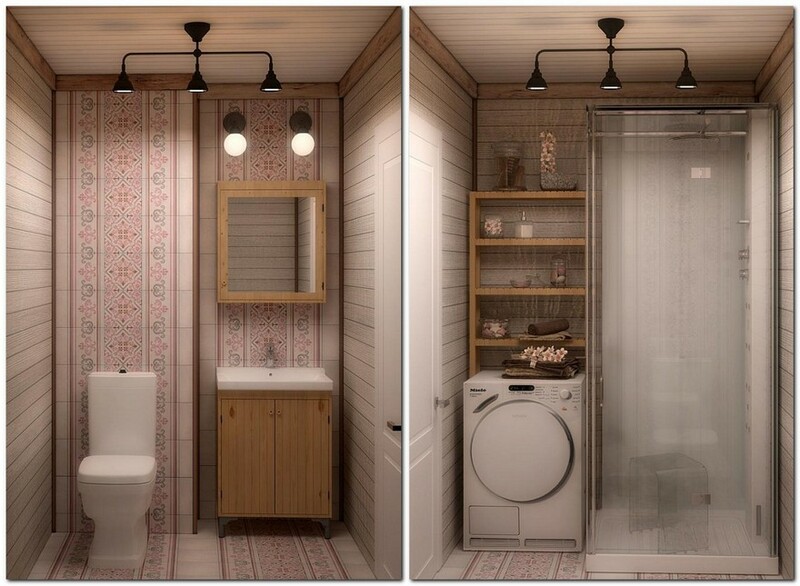 Also, she added an attic with a bedroom, a walk-in closet, a bathroom and a small lounge. 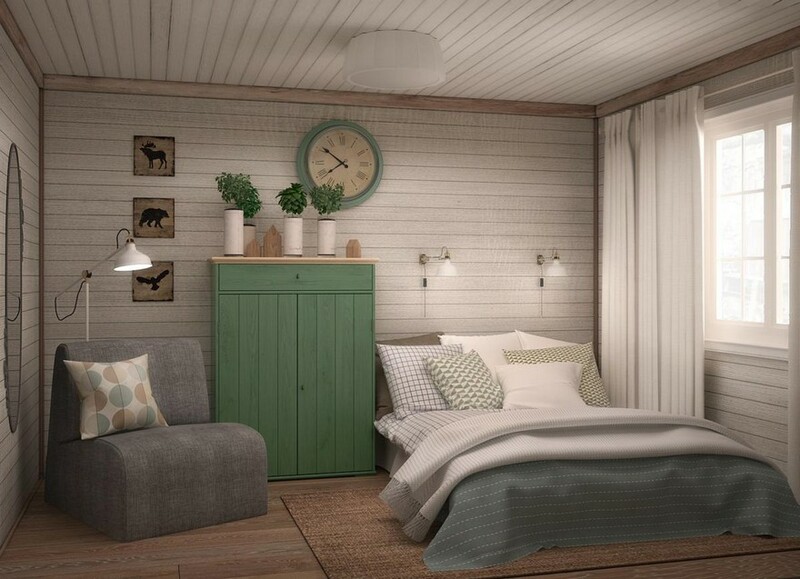 Selected as the leading motif for this interior were elements of Scandinavian style: white walls and wooden floor of a warm tint formed a neutral background for bright traditional patterns. Most of the furniture was purchased from IKEA. 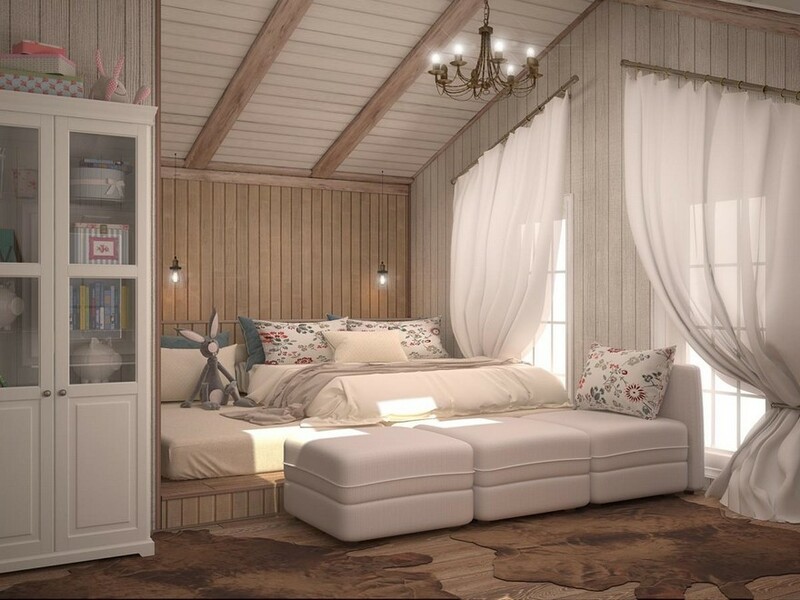 And some smartness and spirit of a traditional log cabin was added by faux ceiling beams, wooden skirting boards and crown moldings painted in the same color as the floor. 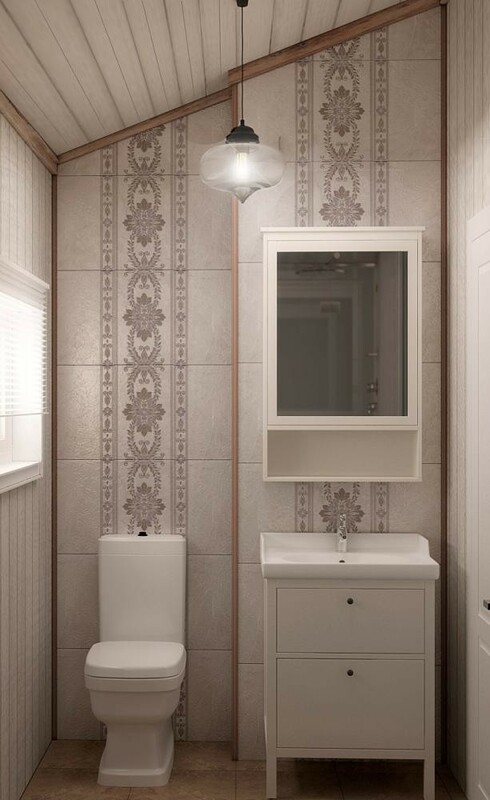 The role of bright accents is played by beautiful ceramic tiles in English style that can be found in many rooms of the house. 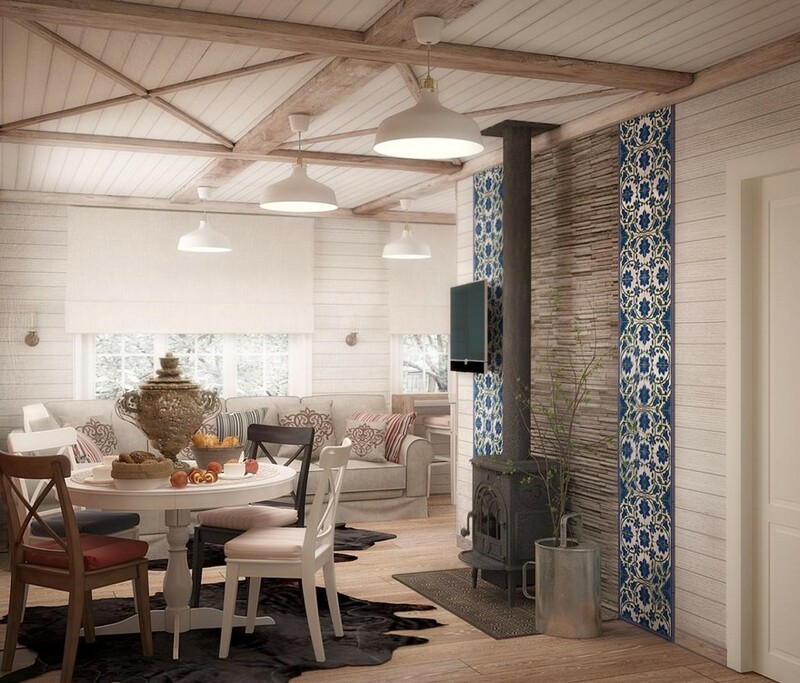 One of the most fascinating patterns can be found on the wall behind the stove in the living room; it is finished with a mixture of ornamental stone and blue-and-white tiles. 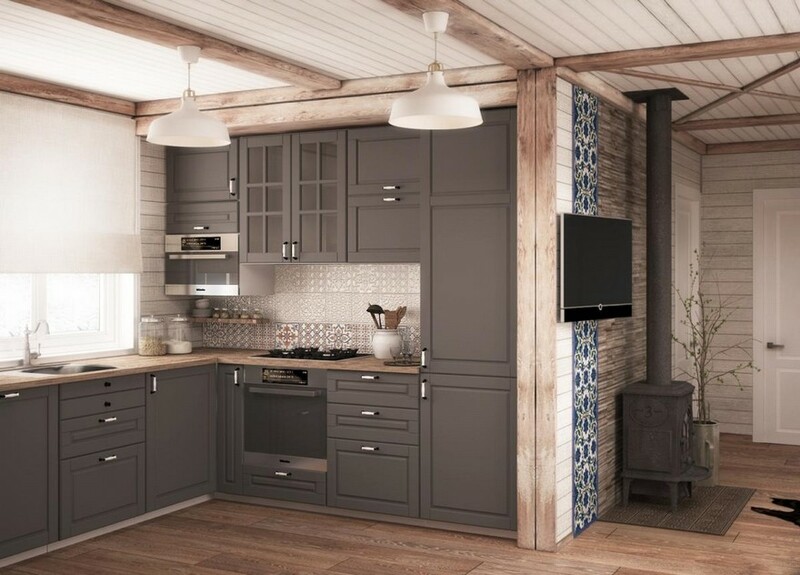 A gray kitchen set is built into a wall recess and hence looks quite compact. Its pretty laconic design is a bit refreshed by beautiful square tiles of the backsplash. Given that the open space was supposed to include a full-fledged kitchen, a lounge and a dining zone, every inch of it was well-thought-out. Thus, the kitchen worktop was extended as a bar table in front of the window with a gorgeous garden view, put in the corner was a big comfy sofa, and opposite the cast-iron stove arranged was a small dining set. The sleeping-place issue in the guest room was handled by means of a folding arm-chair and a double bed. The idea of a big closet was thus abandoned in favor of a compact delicate green wardrobe that actually set the color palette of the entire room. The study interior has quite a similar neutral background, but here it’s refreshed by crossed pattern of ceiling beams. The sense of lightness is added by glass display cabinets and a beige upholstered sofa. But the key color and decorative accent of this room interior is an old masonry heater, the largest part of which is located in the work room and faced with gorgeous blue-and-white tiles in English style. The front part of the heater is overlooking the hall on the first floor. This zone by the staircase is also designed as a small lounge nook with a comfy arm-chair and a coffee table. The master bedroom on the second floor is a spacious room comprising a huge sleeping place for parents, their kid’s bed and a play zone. The original interior solution is a podium with a couple of stacked mattresses for comfortable family sleeping. And kid’s stuff is stored in a glass-door cabinet. A lounge on the second floor is also very light, diluted with just a few blue details found in home textile and on one of the walls. This space is dressed up with a chandelier in the shape of reindeer antlers, big floor flower pots creating kind of a greenery nook and a suspended arm-chair. The bathroom on the first floor is finished with ceramic tiles reminding of traditional embroidery technique. Their rustic spirit is complemented with a wooden wash basin cabinet and a mirror designed in the same style. The bathroom on the second floor is designed quite similarly, but in a lighter color palette and more contemporary style. 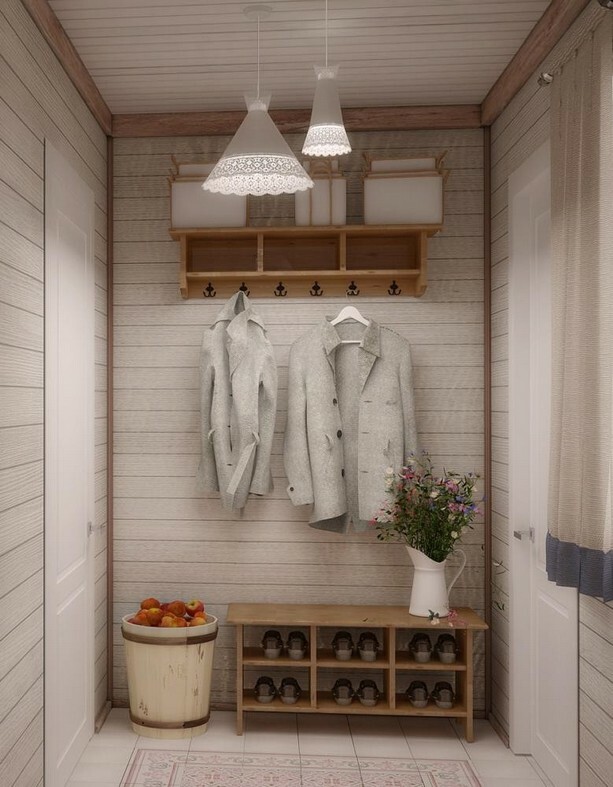 The entry room features casual IKEA shoe and coat racks and light suspended lamps.